I recently had a very profound experience doing a sweat lodge. I immediately felt inspired to write about it and share it here. With a sense of reverence and humility, on hand and knee, I enter the sacred womb of Mother Earth. Touched to learn from our guide, that the prayers offered by my ancestors 7 generations ago are what led me here today. My hand rests upon my heart in acknowledgment of their presence. Together with my beloved brothers and sisters, we chant our prayers over red rock and rising steam. Through my sweat and surrender, that which no longer serves me is drawn from my mind, body, and spirit and rides the waves of tobacco-laden steam out into infinity. Liberated from the cultural sexual objectification of my body that I’d been programmed to believe, I meet my body for the first time. I love it for the first time. I cover it with sacred mud made of my own sweat and the earth beneath me. I feel primal…undomesticated. I feel free. I feel wild. I feel powerful. I cover my face, burying any attachment to identity under a layer of mud. I connect to my truth. I am no less a part of nature than all of nature itself. I belong here. I cover my breasts, sitting tall in acknowledgment and gratitude for the sanctity of my gift to nourish the world around me with the love and compassion of the untainted feminine. The feminine that existed before man branded woman a mere path to his sexual pleasure, reducing our value to nothing more than how desirable are bodies are. I welcome the crow. I partake in its medicine and commit myself to follow its guidance into the great void, the source of all creation. The crow now inhabits my heart and epiphysis with its own; forever my inner compass as I navigate the infinite realms shrouded in magic and mystery. I invite the divine masculine to enter me as I open myself to his pure and wise love. I surrender to his strength and power. I invite the divine feminine to enter me as I open myself to her pure and wise love. I surrender to her grace and compassion. 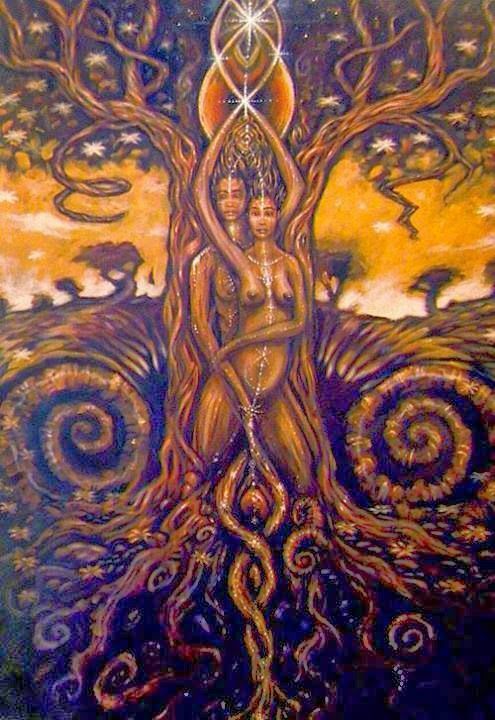 I offer my womb as an incubator for the sacred merging of the divine masculine and feminine that I may carry this holy union to full-term and give birth to wholeness in its purest form. As the chanting ends, I lay my head and heart upon the earth in gratitude for the bountiful gifts bestowed upon me. On hand and knee, Mother Earth’s womb lovingly sends me back into the world with its blessings and those of all my ancestors. I am aware that every step I take, thousands lay their feet upon the very same spot. My feet now lovingly walk the earth as the thunderous voice of my lineage, and my heart now beats to the rhythm of our dance. My eyes now see through the accumulated wisdom of all who came before me. My ears now hear through the wisdom of tales passed on from generation to generation. My nose now smells through the discernment acquired and earned from the survival of my ancient kin. I now speak through the wild chants preserved and shared through the songs sung by my people since the very beginning of time. My spirit now soars upon every single breath my ancestors ever took. I am a pinpoint where consciousness dwells in the sacred moment of now, where all that ever was and all that ever will be…is.